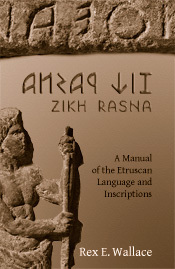 Zikh Rasna is a comprehensive description of Etruscan grammar and inscriptions designed for classicists, linguists, archaeologists, and interested readers in other disciplines. Besides presenting all the grammatical elements of the language, the text also covers important methodological approaches, the alphabet, regional variations in both language and orthography, historical changes, and the evidence for connecting Etruscan to Lemnian and Raetic. It treats nearly 200 inscriptional texts in a wide variety of genres, with word-by-word analyses of great value to students. With its clear exposition and balanced discussions, Zikh Rasna is an essential foundation for the advanced study of one of the most important languages and peoples of pre-Roman Italy. Rex E. Wallace is Professor and Chair of Classics at the University of Massachusetts at Amherst. He is a widely acknowledged expert on the languages and inscriptions of ancient Italy, with research interests also in the history of Greek and Latin and comparative/historical linguistics.